Alanis Morissette updates ironic lyrics to modern struggles. 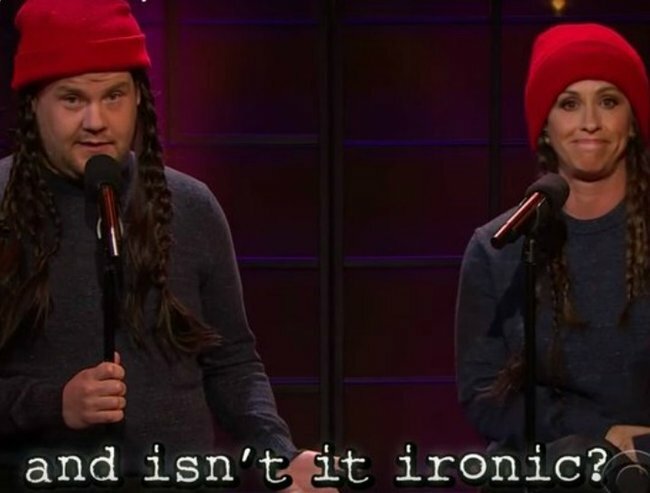 Alanis Morissette rewrites the lyrics to 'Ironic' and it's hilarious. It’s almost hard to believe that Alanis Morissette’s ‘Ironic’ turns 20 this year, along with her iconic album Jagged Little Pill. To celebrate this milestone, Morissette appeared on The Late Late Show with James Corden last night to update her lyrics. Instead of singing about rain on you wedding day, ’90s Queen Of Teen Angst sings about our modern day struggles, ‘an old friend sends you a Facebook request, you only find out they’re racist, after you accept’. And that Amazon package that never arrived. Now, don’t mind us, we’re just off to braid our hair and drive around in cars for a bit. Do you like the updated version? Let us know in the comments.